Join us this Labor Day Weekend in Las Vegas to celebrate you and all of the hard-working people of America on one of our Vegas crawls. 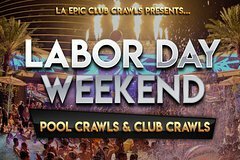 Party with us during the day on one of our Las Vegas pool crawls, or join us when the sun goes down for a club crawl... either way you are sure to have an exhilarating party, unlike any other. Our lineups are posted on our website for both events the week prior. Meet our tour host(s) at the first venue list on the lineup. For a pool crawl, purchase the 11am ticket. For a club crawl, purchase the 8pm ticket.